The San Francisco Pen Show is coming up Friday the 22nd, the same day that I have to fly to Seattle. Luckily for me the SF Pen Show is taking place at the SFO (airport) Sofitel. I need to bring three pens for tuning AND I need to have room for purchases AND I need to have a highly protective case for air travel …so what case do I bring? A big pen wrap? Both of my 3 pen cases (the Nock Co. Lookout and the Pelikan)? I realized that each case is flawed for my purposes…the pen wrap and the Lookout case are soft don’t provide quite enough protection for air travel, the Pelikan case protects well but if I end up buying big pens they wont all fit. While surfing around on the Fountain Pen Network I came across the “Penvelope” by Franklin-Christoph. Penvelopes come in three sizes: 2 pen, 6 pen and 13 pen. I opted for the 6 pen case as this is the most practical for use with a backpack. The 13 pen model is tempting but more appropriate for a briefcase than a backpack. 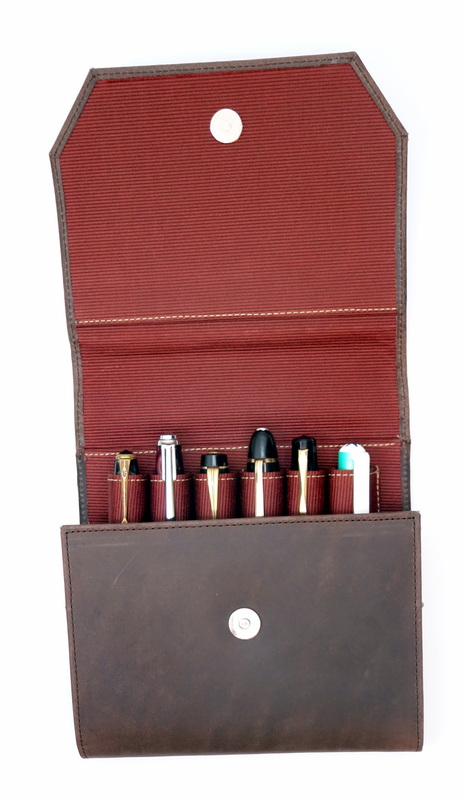 The Penvelope has 6 very spacious slots which can be filled with your fattest pens (up to .75″ wide and 7″ long). You could comfortably fill all 6 slots with Montblanc 149s and none of the pens would touch each other. Left to Right: Sailor Clear Candy, OMAS Paragon, Montblanc 149, Montblanc 136, Recife, Conway Stewart 58. The slots extend almost to the bottom of the case and approximately measure 5″ long in total. 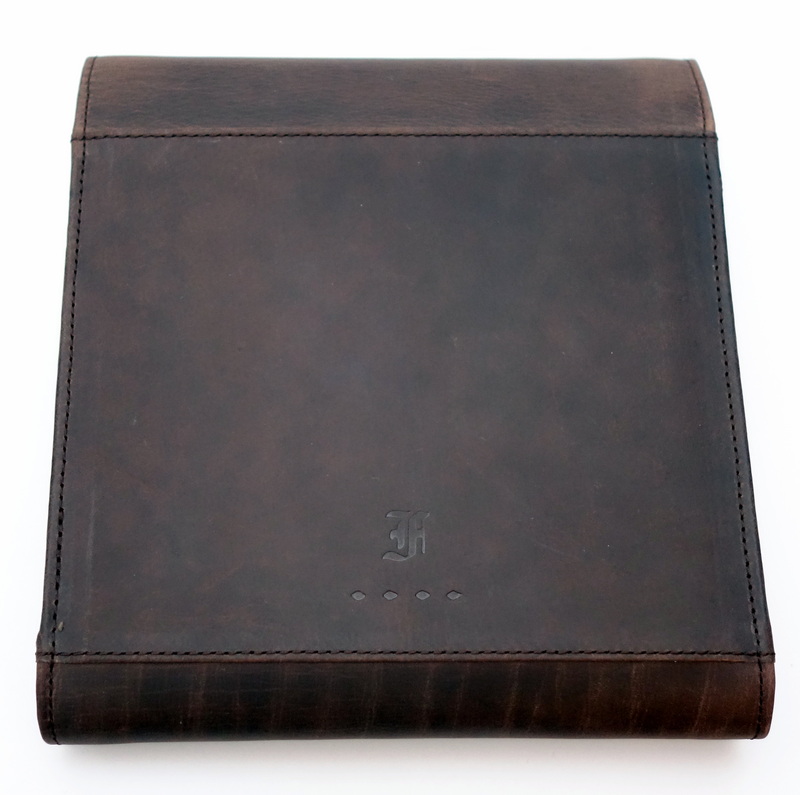 The slots are in from the hard leather edges about .75″ so your pens will be well protected on the sides. Because the slots are so spacious I recommend clipping your pens (especially the smaller ones) so that they don’t move around if the case were accidentally turned over. 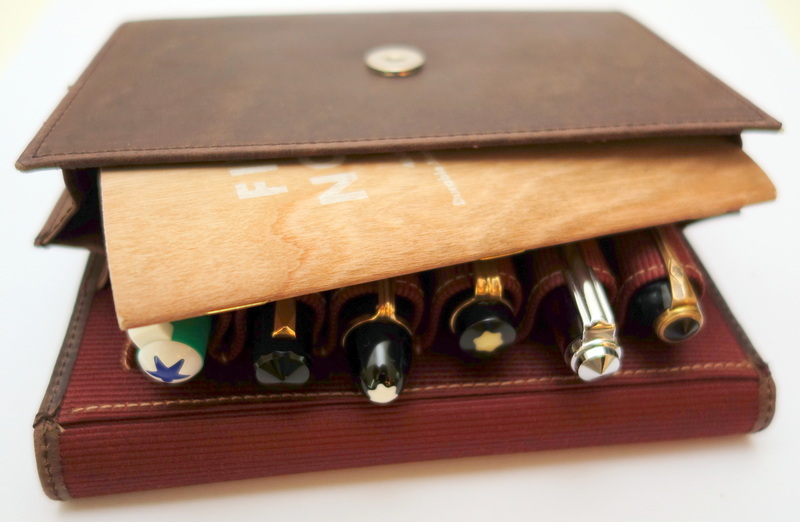 The interior is lined with a burgundy color cloth that Franklin-Christoph claims is safe for all pens. The case closes securely with a magnetic snap. 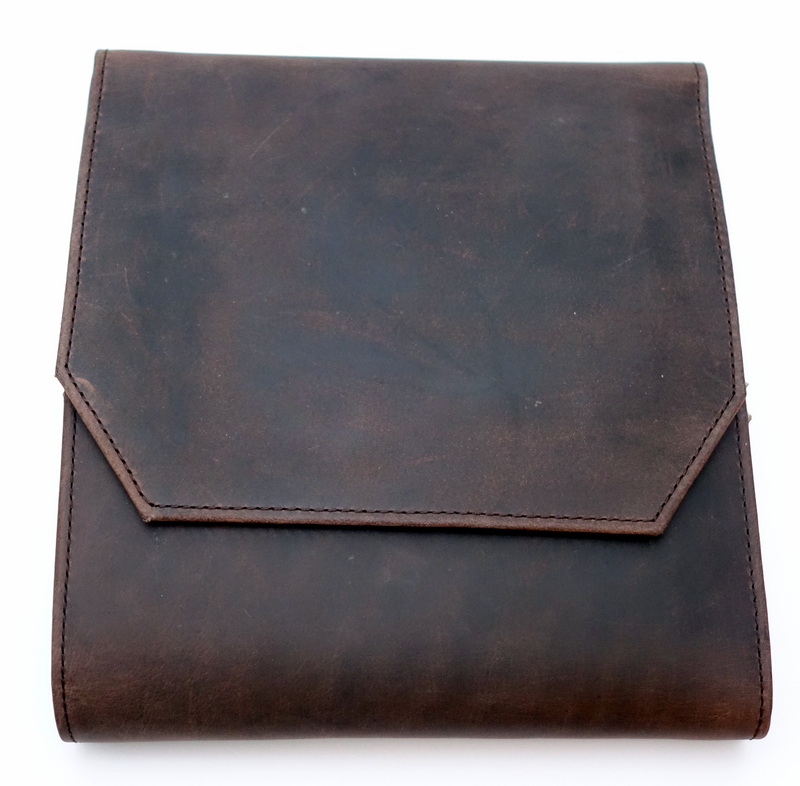 The overall dimensions of the case Penvelope are 6″ wide x 7″ tall x 1.25″ deep. When the Penvelope is filled you it will get a bit fatter. When purchasing a Penvelope you get three choices of leather: boot leather, Napa leather, and “croc print” leather (yuck!). You can chose black or brown leather (except for the Napa which only comes in black). I opted for the soon to be released brown boot leather because it is thicker and will develop a patina with use. Note the nicely embossed Franklin-Christoph logo. The quality seems decent. It is machine stitched with a thick thread and the stitching is mostly straight. The outer part of the case is made of three pieces of leather and they aren’t combined in the cleanest fashion but for a large $70 leather case these sorts of things are to be expected. You can fit more than just pens in this case. The double gusset allows you to fit a small notebook (I can fit 3 Field Notes in and still snap the case). 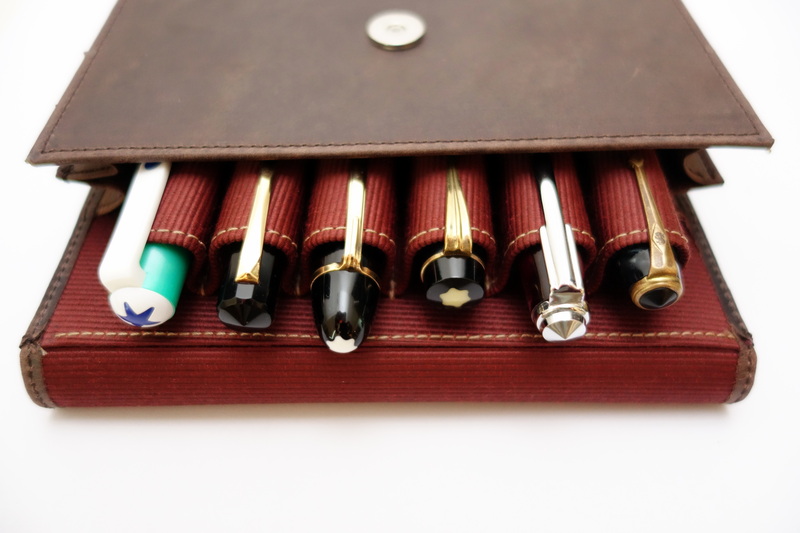 Overall, the Penvelope is an excellent 6 pen case that will protect your pens well. I am not sure it will replace my Nock Co. Lookout as my regular every day carry case but it is definitely my new go-to travel case.